Barnet and Bristol Rovers both head into the final day of the season with a chance of winning the Conference title. Leaders Barnet, who are one point ahead of the second-placed Pirates, face Gateshead at home on Saturday. Bristol Rovers, who were relegated from League Two last year, take on Alfreton at the Memorial Stadium. "Anyone can get promoted - this is to be champions," said Bees boss Martin Allen. "Champions is special. Champions is extraordinary." Allen was the man Barnet chairman Tony Kleanthous turned to after the north London club were relegated from the Football League in 2013 and floundered in the Conference last season. The 49-year-old, in his fourth spell as Barnet boss, is hoping to secure his first promotion with the Bees. Having been top of the table for most of the season, Allen is looking to draw on his experience from his time at Gillingham, with whom he won the League Two title in 2013. "We had our wobble a couple of months ago and have come back since that," he told BBC London. "I have had some amazing times here. All I want for our players is to be the champions. "The championship I won at Gillingham two years ago is the proudest moment of my whole career. This would be right up there with that one. "Just like my Gillingham group, there is a real team spirit and camaraderie and there is a great relationship with the supporters. "There is a proper vibe and on Saturday afternoon I think we are ready to do something special." Rovers, meanwhile, are aiming to become the first side since Darlington in 1990 to follow relegation from English football's fourth tier by winning the Conference title the next season. The club's 94-year stay in the Football League ended on the final day of last campaign, when they were beaten at home by Mansfield Town. 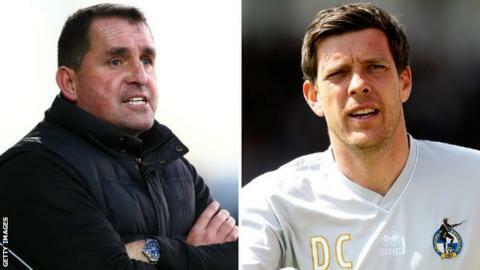 Manager Darrell Clarke took over from John Ward with the Pirates six points clear of the bottom two and eight matches left to play, but the ex-Salisbury boss could not prevent them from dropping into non-league football. "It was the worst summer of my life last summer - it was for all Bristol Rovers supporters," Clarke told BBC Points West. "We've been through a lot and I thank the supporters for giving me the opportunity to turn the club around. "It hit rock bottom with relegation last season and it's taken a lot of effort to pick it back up. "But we've now got two chances - we've got a chance to win the league and, if we don't, we've got a chance to get through in the play-offs, and that's testament to everyone at the club." With Grimsby already assured of a play-off place, Eastleigh, Forest Green Rovers and Macclesfield are embroiled in a three-way tussle for the two remaining spots. Just two points separate the trio but, if fourth-placed Eastleigh win at home to Kidderminster and Forest Green in fifth beat Dover at The New Lawn, both are guaranteed to qualify for the play-offs. Sixth-placed Macclesfield, who also have a poorer goal difference than their rivals, are away at Torquay United. With Telford, Dartford and Nuneaton already down, the final relegation place will be taken by either Alfreton, Welling or Southport. Alfreton currently occupy that spot, but are level on points with Welling, who host Southport on the final day. Nicky Law's side also have the poorest goal difference of the three sides, but if they are able to better Welling's result their survival will be assured.